Chem. Eur. J., 2015, 21, 5488–5495. c Faculty of Materials Science and Engineering, Warsaw University of Technology, Wołoska 141, 02-507 Warsaw, Poland. Alkylzinc alkoxides, [RZnOR′]4, have received much attention as efficient precursors of ZnO nanocrystals (NCs), and their “Zn4O4” heterocubane core has been regarded as a “preorganized ZnO”. A comprehensive investigation of the synthesis and characterization of a new family of tert-butyl(tert-butoxy)zinc hydroxides, [(tBu)4Zn4(μ3-OtBu)x(μ3-OH)4−x], as model single-source precursors of ZnO NCs is reported. The direct reaction between well-defined [tBuZnOH]6 (16) and [tBuZnOtBu]4 (24) in various molar ratios allows the isolation of new mixed cubane aggregates as crystalline solids in a high yield: [(tBu)4Zn4(μ3-OtBu)3(μ3-OH)] (3), [(tBu)4Zn4(μ3-OtBu)2(μ3-OH)2] (4), [(tBu)4Zn4(μ3-OtBu)(μ3-OH)3] (5). The resulting products were characterized in solution by 1H NMR and IR spectroscopy, and in the solid state by single-crystal X-ray diffraction. The thermal transformations of 2–5 were monitored by in situ variable-temperature powder X-ray diffraction and thermogravimetric measurements. 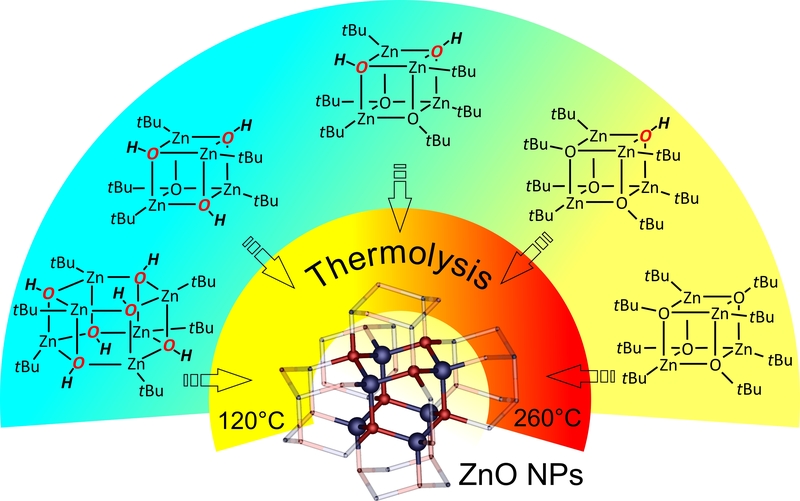 The investigation showed that the Zn–OH groups appeared to be a desirable feature for the solid-state synthesis of ZnO NCs that significantly decreased the decomposition temperature of crystalline precursors 3–5.